Coming-of-age youth drama about the nature of small town American friendships in the 1950s is probably the last thing on people’s minds when horror maestro novelist Stephen King’s name is dropped. 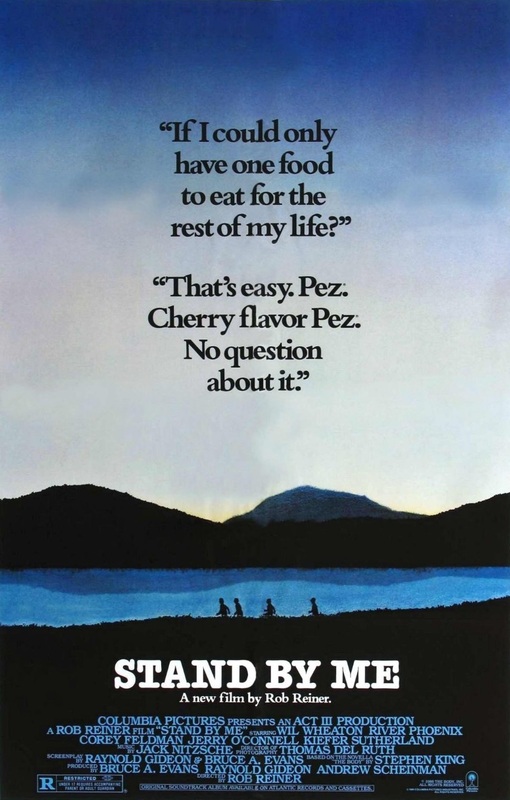 But in 1986 with the help of director Rob Reiner and writer-producer Bruce A. Evans and co-writer Raynold Gideon, that typically unfathomable notion in the eyes and ears of moviegoers became a flesh and blood reality and continues to endure as a prime example of some of the finest ensemble child acting ever captured on film. More than anything, it’s a fresh slice of small town American life seen through the eyes of delinquent youths whose journey for fame and fortune results in a myriad of unexpected and increasingly poignant self-discoveries. Based upon the novella The Body from King’s anthological text Different Seasons with the title harkening back to Ben E. King’s timeless 1960 single track Stand By Me, the film tells the story of four teenage boys who over Labor Day weekend venture out into the Castle Rock, Oregon woods in search of Ray Brower, a boy their age who disappeared and is presumed dead. Amid their sojourn, a rival older gang headed by Ace (Kiefer Sutherland) and Eyeball Chambers (Bradley Gregg) also seeks the missing body which present their own set of tense obstacles for the group of kids. As with the novella, Stand By Me is told through voiceover narration in recollections by the central character Gordie Lachance (Wil Wheaton/Richard Dreyfuss) and we quickly learn how each of his peers, Chris Chambers (River Phoenix), Teddy Duchamp (Corey Feldman) and Vern Tessio (Jerry O’Connell) emerged from dysfunctional families in the small factory working town. While the goal of the four is single minded, the novella and film unfolds in episodic form chronicling the highs and lows of their extended walk deep into the woods. It’s an often hilarious, thrilling and even heartbreaking trip which unmasks the delinquent cool each of them carries to reveal the fragile human within each youth. Initially slated to be directed by soon to be Fatal Attraction director Adrian Lyne before ultimately passing on the project, Stand By Me instead was picked up by This is Spinal Tap director Rob Reiner who offered his own suggestions to the initial script prepared by Evans and Gideon, notably shaving off some of the edgier events awaiting Gordie Lachance and in particular giving the fates of his three peers a somewhat softer landing than in the novella. Reiner also found creative latitude with the material with elements of Gordie Lachance’s troubled home life echoing his own efforts to break free from his father Carl Reiner’s shadow. 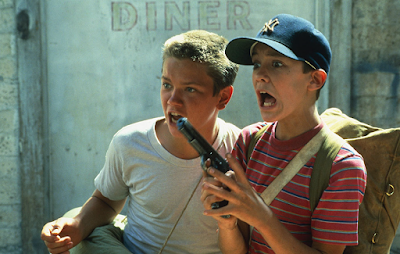 Also having typically directed comedies, Stand By Me presented Reiner with a chance to show he could do drama well while also satisfying King’s own aims to prove he was more than just a horror author. As aforementioned, the ensemble acting is splendid across the board with every cast member giving their all and fully embodying King’s characters with immense attention to detail anchored by heartfelt emotions ranging from joy to sorrow and finally self-actualization. Equal props must be given to the technical team which brought King’s semi-autobiographical coming of age tale to life, with scenic and often gorgeous cinematography of the natural rural landscapes of Oregon by Thomas Del Ruth. Also aiding the proceedings is a moody score by Starman composer Jack Nitzsche interspersed with an eclectic mix of 50s and 60s oldies including but not limited to Jerry Lee Lewis, Buddy Holly, The Del-Vikings, The Coasters and of course Ben E. King’s unforgettable title track. The soundtrack album itself was a smash hit and revitalized the collection of oldies that defined the time period and chronicled the boys’ journey into the woods. The efforts proved to be in the filmmaker’s and author’s favor when the film not only went on to become a box office success, grossing some $52 million against an $8 million budget, but proved to be a critical success as well. Thanks to the commercial success, Rob Reiner went on to co-found the film/television company Castle Rock Entertainment, which soon became the main production company behind many of the forthcoming Stephen King film adaptations produced throughout the 90s and new millennia. Further still, the locations used to shoot the film in Brownsville, Oregon soon became a tourist attraction with a 25th Anniversary Celebration of the film held including a cast and crew Q&A, an outdoor blueberry pie eating contest ala the film’s most riotous gross out comedy sketch and an outdoor showing of the film. Further still, an advertising mural for the film’s production was painted for the city of Brownsville and received official recognition by the Brownsville Chamber of Commerce in 2013. Garnering two Golden Globe nominations as well as an Academy Award nomination for Best Adapted Screenplay, Stand By Me arguably the film’s biggest honor came from King himself who indicated on the film’s 25th Anniversary that to this day he considers it to be the first successful translation from novel to film of any of his works. Reportedly at an early private screening of the film, King excused himself for about fifteen minutes before returning to tell Reiner that Stand By Me was ‘the best film ever made out of anything I’ve written’. 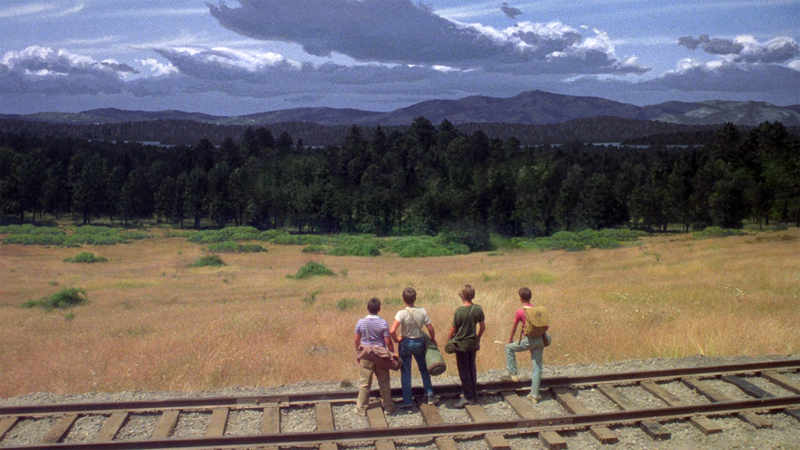 Though King would go back and forth on which film adaptation he still considers the truest to his vision with some misgivings about others that have come and gone, Stand By Me is the first one he officially endorsed as having done his work justice. 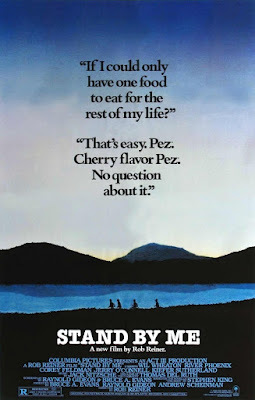 As it stands, the film remains one of the greatest coming of age youth dramas of the 1980s with a sense of joy, exuberance and poignant bittersweet yearnings for one’s childhood years. If there’s ever a film that truly captures on film what it means to be an adolescent finding their way into the world and the vitality of the bonds of friendship in our daily lives, second to Truffaut’s The 400 Blows, Stand By Me is it!